The elegant simplicity and graceful presence of this sterling silver necklace is the creation of Wayan Sarjana, a dedicated silversmith from Bali. Delight in the polished gleam of an exceptional piece with a sparkling, dramatic effect. 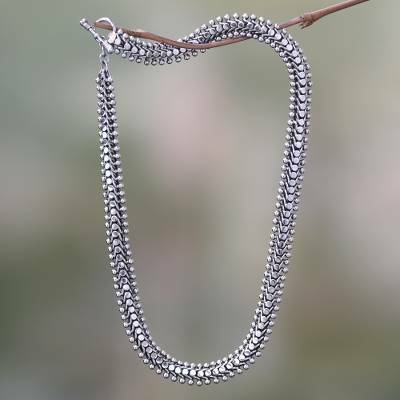 You can find sterling silver chain necklace 'Centipede Crawl' by Wayan Sarjana in jewelry categories such as No Stone Necklaces, Silver Necklaces, Sterling Silver Necklaces and Chain Necklaces. Enjoy exploring these sections for other Novica treasures. "Like to have it around my neck"
Great work that matches the bracelet. I don't think I will ever own another necklace like this! The workmanship is absolutely amazing!! I am so thrilled with it!! Thanks to eBay, I would not have known about this awesome company. I was looking for silver bracelets from Bali, and I found Novica!! These artisans have such a special gift, and I'm so happy to have found them!! And what a precious little postcard that was enclosed in my package! Thank you so much!!! "Beautiful necklace, and a work of art "
This necklace is just gorgeous! It is lovely to wear with almost anything, and it?s beautifully made. It has a really nice weight to it, and is a work of art. This necklace is stunning! The handcrafted silverwork is amazing. The fit is perfect. The piece is weighty, lays just right on my neckline. You can really tell a lot of time and skill went into creating it. Workmanship like this is becoming more rare, so I'm very pleased with this purchase.